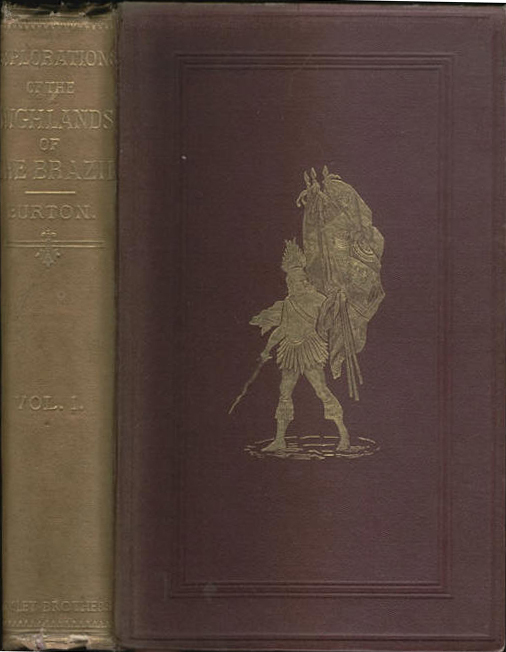 Explorations of the Highlands of the Brazil. First edition of 1869 in two volumes. Volume 1 PDF Page Images. Volume 2 PDF Page Images. BEFORE the reader dives into the interior of Brazil with my husband as a medium, let me address two words to him. I have returned home, on six months' leave of absence, after three years in Brazil. One of the many commissions I am to execute for Captain Burton, is to see the following pages through the press. It has been my privilege, during those three years, to have been his almost constant companion; and I consider that to travel, write, read, and study under such a master, is no small boon to any one desirous of seeing and learning. Although he frequently informs me, in a certain Oriental way, that "the Moslem can permit no equality with women," yet he has chosen me, his pupil, for this distinction, in preference to a more competent stranger. As long as there is anything difficult to do, a risk to be incurred, or any chance of improving the mind, and of educating oneself, I am a very faithful disciple; but I now begin to feel, that while he and his readers arc old friends, I am humbly standing unknown in the shadow of his glory. It is therefore time for me respectfully but firmly to assert, that, although I proudly accept of the trust confided to me, and pledge myself not to avail myself of my discretionary powers to alter one word of the original text, I protest vehemently against his religious and moral sentiments, which belie a good and chivalrous life. I point the finger of indignation particularly at what misrepresents our Holy Roman Catholic Church, and at what upholds that unnatural and repulsive law, Polygamy, which the Author is careful not to practise himself, but from a high moral pedestal he preaches to the ignorant as a means of population in young countries. I am compelled to differ with him on many other subjects; but, be it understood, not in the common spirit of domestic jar, but with a mutual agreement to differ and enjoy our differences, whence points of interest never flag. Having now justified myself, and given a friendly warning to a fair or gentle reader, � the rest must take care of themselves, � I leave him or her to steer through these anthropological sand-banks and hidden rocks as best he or she may.